We no longer have this item for wholesale ordering. We are partnering with Pacific Trading to begin carrying this through their catalog. To order, please visit Pacific Trading and search for "Oberon". This "Dearinth" is my unique variation on the ancient labyrinth (originally meaning "house of the labrys') a single path leading around and around, doubling back upon itself multiple times, leading into the center, and back out again. It is seen as a path of pilgrimage or initiation, and large-scale labyrinth patterns have been found throughout the world over several thousand years, intended to be walked as a meditation. Some have even been inlaid in the floors of Medieval cathedrals' the most famous of which is at Chartres in France. The Dearinth comprises nine circuits' representing the orbits of the nine planets of our solar system. 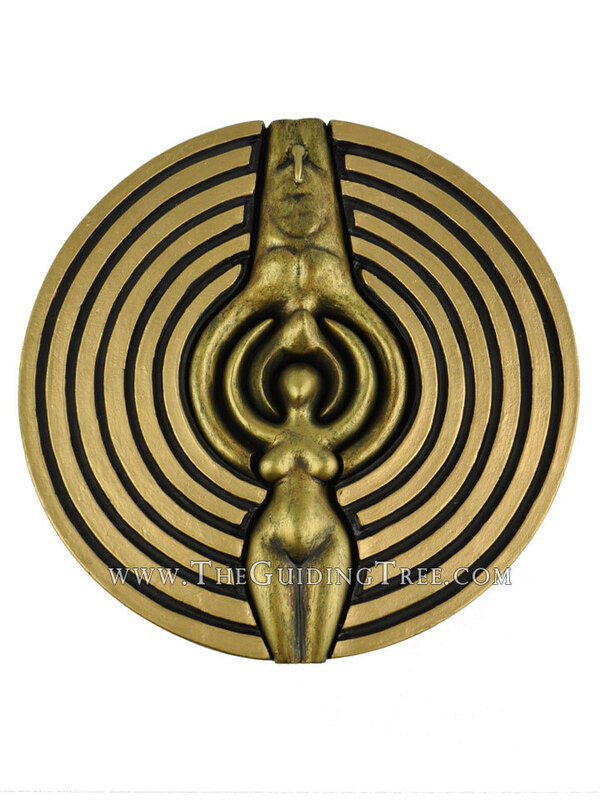 Following the recessed path will take you through all nine circles while also tracing the outlines of the God and Goddess, which are both integral and immanent in the design. The sacred marriage of Heaven and Earth (Ouranos and Gaia) is beautifully represented here as Mother Earth reaches up to embrace Father Sky, while He reaches down to embrace Her. The Goddess stands with her arms upraised as a crescent, in the epiphany posture of "Drawing Down the Moon." Such empowering female images have been depicted for millennia. Branches growing out of Her body may be seen as the eight branches of the Hebrew Goddess Asherah as the Tree of Life (as in a Hanukah Menorah); or they may be viewed as eight limbs, giving her the aspect of Spider Grandmother, Weaver of the Web of Life. Turning the design around brings the image of the God to the fore. Like the Goddess, He holds His arms upraised to the sky - but with them He also holds Her in His embrace. Branches growing from his sides identify him as the Green Man - Lord of Vegetation. From his head grow great bull horns, symbolizing his other aspect as Cernunnos, Lord of the Animals. While the opening at the base of the Goddess draws Earth energy upwards through Her body, the opening at the top (the base of the God) channels down Solar or Cosmic energy, which embraces and interpenetrates Her in the union of Force and Form: the moment of Creation. In this 3-D representation, the God and Goddess are removable, and may be placed upright in recesses in the base. The round central cavity thus revealed is intended for a tea light or votive candle, which will then cast large shadows of the God and Goddess upon the walls of your room.